I spend most of my time writing while sitting on a chair. The idea of exercising while I work is appealing because I imagine that I’d be able to get in a workout when I’m usually just sitting. 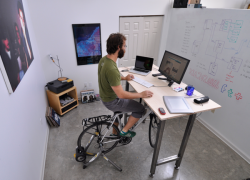 Kickstand Furniture has created an option for me with their Kickstand Desk. It’s a great idea, but they are asking $2500 for the desk, which seems rather steep, especially when I could buy the Vika Amon tabletop at Ikea and their adjustable legs, the Vika Byske, all for less than 200 bucks. Of course, I would recommend also buying a Stig barstool for an extra $20 so that you’ll be able to rest from biking when your poor bottom can’t take anymore from your bicycle seat. The bike is mounted on a trainer to give it resistance while you pedal. 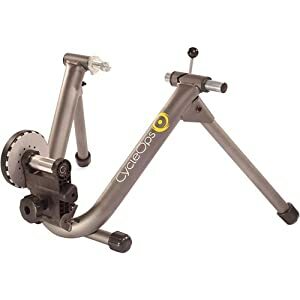 For the last several years, I have used the CycleOps Mag and it has held up really well and is easy to use no matter what bike you are training with. The next time you blame your lack of exercise on your long work hours, remember these options. You could adjust your desk a bit and have a way to work AND exercise all day long.